MMA is a funny sport. It was around this time last year that Anthony Pettis, the former lightweight champion of the world, was considered one of the sport’s pound-for-pound greats. And for good reason, as the Roufusport product had racked up five straight wins in the UFC over the likes of Gilbert Melendez, Benson Henderson, Donald Cerrone, Joe Lauzon, and Jeremy Stephens, with his only loss in the Octagon coming to Clay Guida in his debut. 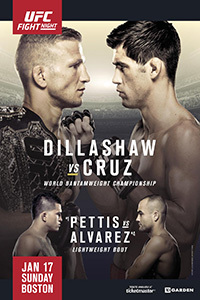 Other than the Guida fight, Pettis looked like a straight-up killer, and there was talk about him either moving to 145 or having former UFC Featherweight Champion Jose Aldo move to 155 for a true superfight between two of the best strikers in the sport. That didn’t happen, of course, because Pettis fought Rafael dos Anjos at UFC 185 and was thoroughly dominated by the unheralded dos Anjos en route to a 50-45 unanimous decision loss, losing his belt in the process. 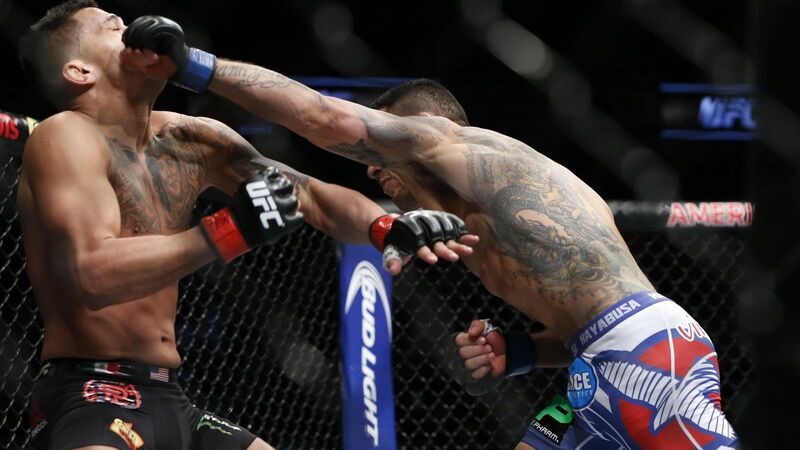 It was by far the worst performance of Pettis’ career, and after shattering his orbital bone in the fight, he had to sit on the sidelines for nearly a year. Dos Anjos, on the other hand, followed up the win over Pettis with a brutal first-round TKO over Cerrone, a win that firmly established him as a pound-for-pound great. Pettis, on the other hand, has been mostly forgotten about. Forgotten, as well, was that superfight with Aldo, as the former featherweight champ was KO’d in just 13 seconds by Conor McGregor at UFC 194. 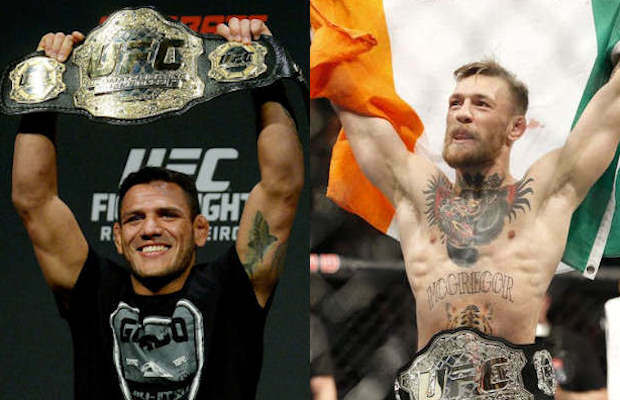 A year after Pettis vs. Aldo was being talked about as the superfight fans wanted to see, now it’s McGregor taking on dos Anjos for the lightweight title at 197 in the new superfight fans want to see. MMA is a funny sport, and this turn of events involving the current and former lightweight and featherweight champions shows just that. While McGregor and dos Anjos will duke it out in the main event of UFC 197, Pettis instead gets a rebound fight against top-10-ranked Eddie Alvarez in the co-main event of UFC Fight Night 81, which takes place this Sunday in Boston. 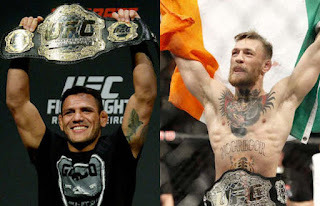 With Alvarez coming off of a win over Melendez, and with Pettis being the former champ, it’s assumed that the winner of this fight will get the winner of McGregor vs. dos Anjos for the lightweight title before the end of the year. That’s why it’s imperative Pettis has a great performance. In a sport like MMA, even a fighter like Pettis, who had run through the best in the world at 155 lbs before running into the buzzsaw known as dos Anjos, has been somewhat forgotten by fans. A year ago this time, Pettis’ next fight would have generated considerable hype amongst MMA aficionados. But it seems like this fight with Alvarez, which is a an excellent matchup when you really look at it, is being lost in the shuffle, and that’s mainly because all of the talk in the MMA world at the moment surrounds McGregor, dos Anjos, and their superfight in March. Pettis is being overlooked, and it will be up to him this weekend to reclaim the fans’ hearts when he fights Alvarez in Boston in what should be a “Fight of the Night” candidate on the UFC’s second card of the year. There’s no doubt the UFC lightweight division is going to be a big draw for the UFC this year with McGregor moving up in weight and with dos Anjos doing his thing, but don’t forget about the former champion Pettis. He’s still only 28 years old, right smack in the prime of his career, and if he rebounds after the loss to RDA like he did after the loss to Guida five years ago, the rest of the lightweight division better watch out. Don’t be surprised if it’s Pettis fighting McGregor later this year as the UFC continues to deliver the most exciting fights that the fans want to see.